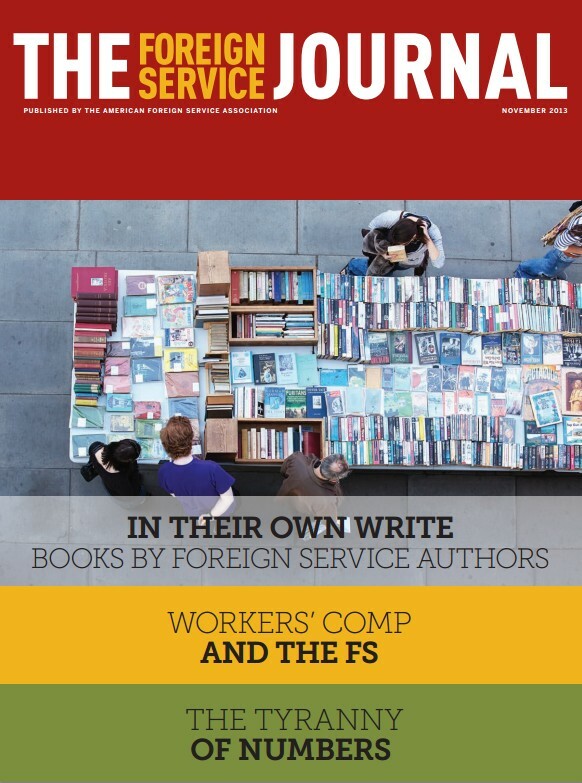 The November issue’s focus is the annual In Their Own Write, a compilation of new books by Foreign Service authors. Our senior editor Susan B. Maitra presents this year’s roundup of books published by members of the Foreign Service community. The article is followed by our Of Related Interest segment, a listing of books not written by Foreign Service members but nevertheless of interest to the diplomatic community. This month’s feature is Ambassador Charles A. Ray’s The Tyranny of Numbers. Ray’s final Foreign Service posting prior to retirement was as Ambassador to Zimbabwe. He provides an insight into the difficulties of performance measurement in the diplomatic world. Foreign Service Officer William Roebuck offers a poetic tribute to the late Ambassador Christopher Stevens in Libyan Reflections. In Keeping Faith with State’s Wounded Warriors, Foreign Service Officer Juliet Wurr details the difficulties of dealing with the bureaucracy after facing illness and injuries while on duty. Finally, in his President’s Views column, AFSA President Robert J. Silverman discusses Due Process and the Collective Good, delving into AFSA’s dual nature as a professional association and labor union.